"Move. Feel yourself occupy a different path. Apply cold logic, and where logic fails, apply rage. Is your existence preordained? Choose it otherwise. You are an outward expression of formlessness, a soldier of the oldest questions. This is the first choice you have ever been given." Seditious Mind is a Taken Hydra that was captured and imprisoned within the Prison of Elders. 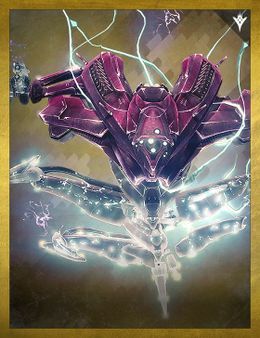 The Seditious Mind operates like any ordinary Hydra, yet it has the ability to summon Taken troops at will, but it lacks the semicircular shield of Vex Hydras, making it more vulnerable to attack. It will mainly stay in the center of the arena as well, meaning players can lay down sustained fire on it, although it will occasionally move out of the way if damaged for too long, and it will "detonate" if a Guardian gets too close. However, in Challenge of the Elders, it will gain the ability to summon a blight bomb above an unaware Guardian's head. Before the bomb above detonates, it will create a circle of fire that will periodically damage any Guardians trapped inside. After a few seconds, the blight bomb will explode and either heavily damage or instantly kill any Guardian who hasn't gotten out of the way. Concept art of Seditious Mind.